They say the truth will set you free. They say you should always tell the truth. They say that truth is stranger than fiction. They also say that broccoli is good for you, so I don’t put much faith in the high and mighty “they.” It’s tough for some people to tell the absolute truth, politicians for example. They bend it and twist it and stretch it like it’s a giant rubber band, until it snaps in half and slaps them in the face. Basically, the truth is what all of us Americans wish we were. Now that’s a serious life goal. At Animal Rescue of Fresno, we’ve been known to dance around the truth, but only when it’s absolutely necessary. I’m not talking about a full on quick step, but something more like a slow waltz. 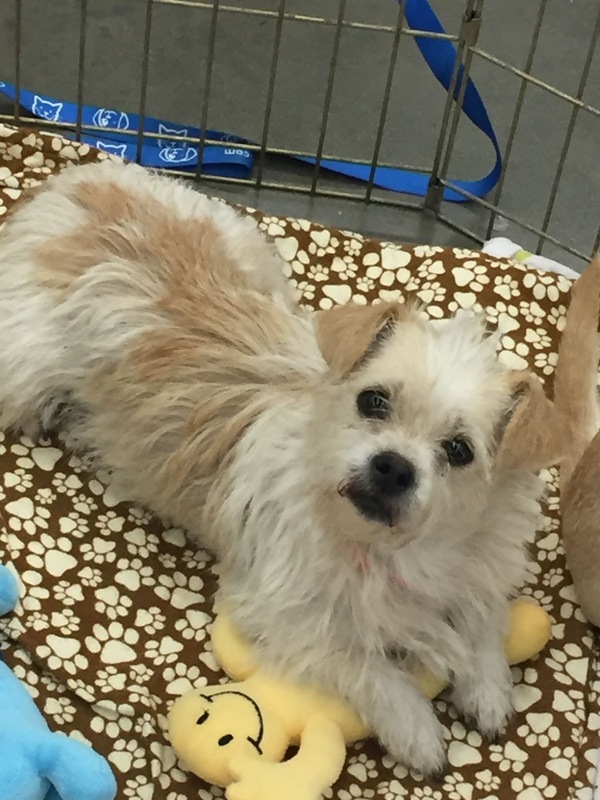 When a potential adopter is looking at a Terrier mix, but thinks the pup looks more like a Beagle, hey, we’ll make the paperwork say whatever they want. Searching for the elusive mini-Malti-Mastiff-Manchester-mutt? No problem. How about a standard-silky-Swedish-Shiba-Shepherd? You got it. Looking for a petit-Pembroke-Pom-Pug-Portuguese-Poodle? We can make it happen, and that’s no lie. 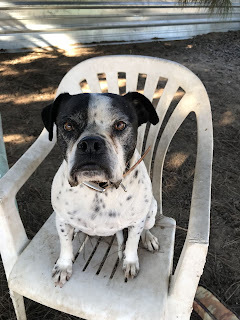 When it comes to our dogs, Animal Rescue of Fresno is all about the truth. We don’t believe in hiding anything. If a dog has a bad habit of jumping like a kangaroo on crack, we will certainly let you know. When a dog enjoys digging his way to freedom like a prisoner with a purpose, we’ll let you in on it. And if a mutt loves dog-paddling like Michael Phelps in the summer Olympics, we’ll definitely give you a heads up. Wet dog, bleah. There are plenty of ARF dogs with some quirky, but always amusing,behaviors. Take Yoshi, who looks like a Boston Terrier on steroids with his buff physique and squishy face. Another athletic type, Yoshi channels his inner LeBron James, and can’t get enough of his beloved basketball. He rolls it across the yard, then spins it underneath his burly chest, his paws working in a frenzied blur of black and white. All he needs is a net for the true NBA experience. Now let’s shoot some hoops! 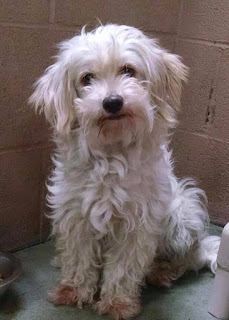 And then there’s Dazzle, a scruffy vanilla Terrier, who came into ARF as shy as a frightened turtle. 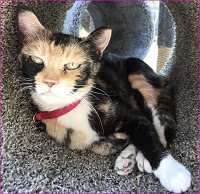 Because of her bashfulness, Dazzle’s been receiving extra TLC, so we can help this little cutie come out of her shell. With the arrival of a cheerfully decorated playpen in her yard, Dazzle is now much more outgoing. She scampers around with the other puppies, and can usually be found curled up inside the playpen, her adorable face poking thru one of the openings. Hey, who’s up for some hide and seek? Whether a dog is painfully shy, or has a silly disposition, we are always honest and upfront about their personality. Or in a case like Alex, his personalities. A bit of a Jekyll and Hyde, Alex may be one of our smaller residents, but he makes up for it with a big presence. 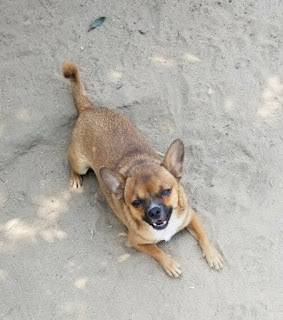 A reddish-brown Chihuahua mix with a curly tail and sneaky grin, Alex picks the people he likes or dislikes with meticulous precision. To wit; he’s been known to chase certain volunteers around and bite their ankles. And no, I don’t know why. I don’t have any issues with Alex, and can easily pick him up for snuggles and extra sloppy kisses. Him, not me. And while he happily licks my face off, I cannot understand while he races after others like a cheetah chasing an ostrich. Luckily, he’s only a tiny terror, so all knees are safe. For all we know, there are things that Alex just doesn’t like, or remind him of something or someone from his past. We know he’s not crazy for kids, but hey, neither am I. Perhaps he doesn’t like brown hair, green eyes, or perfume. It’s possible he isn’t fond of hiking boots, high-pitched voices, or sunglasses. Or maybe, just maybe, he’s being a brat. Still, he deserves a chance for a home of his own, as I know he can be the sweetest dog on the planet. It’s just going to take that special someone. It might even be you. So the next time you have a free weekend, come on out to ARF and meet Alex. Just remember to wear your thickest socks. 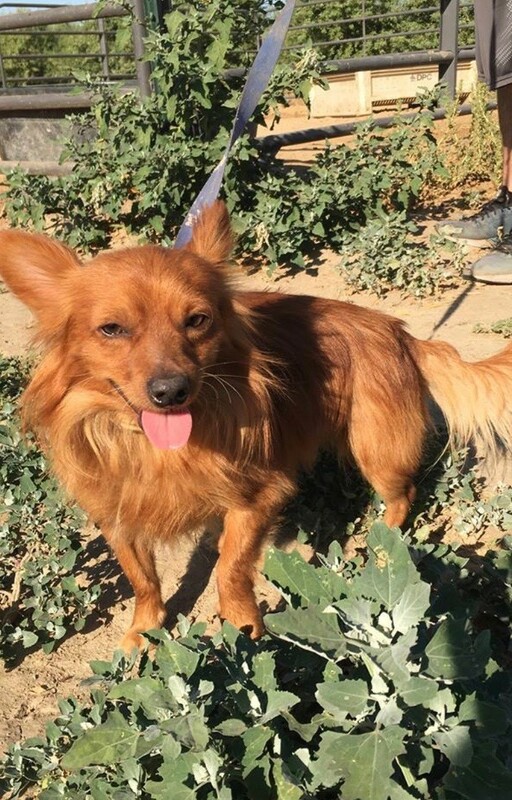 For sheer beauty, you can’t beat the amazing red coat of Rusty, a lovely Spaniel/Terrier mix. He’s the early 2000’s version of Nicole Kidman, with smooth strawberry-blonde strands, shimmering with gold highlights. He’s one of those dogs that women go crazy for, because what female wouldn’t want those luxurious locks? The people at L’Oreal have nothing on this color. Rusty’s had a tough life, and was in foster care before arriving at ARF. His foster family valiantly tried to find him a forever home, and finally realized he needed a bit more care than they were able to provide. I vividly remember the day Rusty came in, and I was handed this terrified little package of gorgeous fiery hair. He was shivering like a corrupt CEO when 60 Minutes arrives on their doorstep. He gingerly pressed his head into my arm when I scratched his head, and flinched whenever somebody walked by. For the longest time, Rusty had a leash permanently attached to his collar because he wasn’t fond of bedtime, strangers, or being picked up. These days, Rusty has become much more trusting toward volunteers, and more playful with his yard mates. He is also learning the fine art of kennel training. Now, all I have to do is sit in a chair, and ask Rusty to come over. He easily jumps into my lap, and presses his face into my arm. But this time, when I pet the hair on his beautiful red head, he doesn’t cower at all, but seems to want more. One of these days, he’s going to get a glamorous grooming. Hmm, I wonder how he’d feel about sponge rollers. In a perfect world, all dogs would stay with the same family for a lifetime. The only family they’ve ever known, the attachment growing stronger with every sunrise. Of course, in a perfect world, the Oscar Awards show is only an hour long. Nobody knows this better than Rosy, a fluffy Havanese mix who looks like she’s made of frothy meringue. Rosy dances on her back legs for you to pick her up, her front paws extended out like a ballerina. The funny thing is, she doesn’t seem to know quite what to do after that. She hangs in your arms like a sad sack of potatoes, her limbs dangling, her face turned away from any impending kisses. Usually, I remind her that I used my mouthwash that morning, but it doesn’t seem to matter. I try not to take it personally. Unlike many ARF dogs, Rosy’s fond of children. She loves to cuddle, and for the most part, is calm and quiet. She can be a bit standoffish to strangers, and even a little snippy, but she warms up quickly. Having lived her previous life outdoors, Rosy would enjoy being an inside dog, with all its perks. A cozy bed, tasty treats, and someone to snuggle with on the couch. Because when the everlasting Oscars begin, you want to fall asleep with someone by your side.